Having a walk-in closet in your master bedroom could be a dream come true for you. It’s like adding a little bit of sophistication to your bedroom while at the same time, getting everything else organized for storage purposes. The only bad bit about having this exquisite piece of furniture is that it can take up a large amount of space. Any creative person should work with what he/she has and make the best out of it. This should apply for your storage needs and the smart walk-in closet you’ve always dreamt of as well. Below are some important tips to help you come up with a closet that is worthy. advisable to go for the U shaped closet. For the people with huge bedroom spaces, the L shape could work better in such a huge space. For partners sharing a room and they are a shortage in the space, a straight walk-in closet is recommended. When choosing any kind of closet shape, always let space available guide you. Maximizing on the storage space of the closet is something you ought to do. Normally, a walk-in closet has components like the cabinets, drawers, shelving and hanging spaces. Always utilize the cabinets and drawers by storing clothes and other valuable assets. Storing the clothes in the cabinets keeps them away from the dust and creases. For the clothes, you feel like you need easy access to utilize the hanging spaces and install shelves where you can keep your shoes and other smaller accessories. Closets are well known for their additional function of holding some sentimental items for you. You can incorporate creative and decorative storage areas that display some of your valuable accessories such as the jewelry, bags, ties and even apparels. You can mimic various classic boutiques arrangements where the owners create different levels and create different patterns in the arrangement of these accessories. Think outside the box and come up with something special and showcase your accessories in an orderly manner, while also maintaining organization in your closet. In order to be successful in this activity try and be simple and space out your items in an uncluttered fashion. Lighting plays a vital part in giving your walk-in closet the finishing touch. Having the right lighting creates a quality and interactive ambiance which thing gives you a special feeling while doing your thing. Before you think of the lighting, consider the shape size and design of your closet to help you come up with good lighting ideas. Go for a track light to help illuminate those colors on all corners of the closet. To complement the overhead lighting consider installing under the counter lights to add on the magic. The lighting fixtures used normally include fluorescent and LED bulbs which are effective in shading light in the dark areas and corners of the closet. Incandescent bulbs don’t go well with closets since they produce more light and heat which may not convenient you while applying makeup. Having a walk in closet is a luxury for a lot of people. The only negative side of having a walk in closet is how much space it takes up. 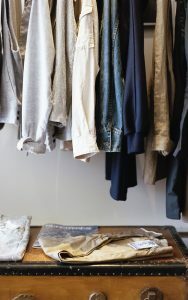 Although these closets do take up an ample amount of space, making your walk in closet into a smart one can provide you with a lot of benefits that you haven’t even thought about. With a smart walk in closet, you can connect your lighting to your handheld devices and maximize the storage that you have.